For thousands of years, the Chinese believed that they had created a perfect social system. Dynasties came and went, but “Chineseness” remained essentially unchanged until the twentieth century. Japanese invasion, civil war and revolution put the country on a new path under the leadership of Mao Zedong and the Communist Party. While China was largely closed off from the rest of the world, since Mao's death in 1976 huge changes have taken place. The country cautiously opened its doors to the West and introduced a nascent market economy, called “socialism with Chinese characteristics.” While China became the “workshop of the world” low wages and a low yuan boosted exports and gave jobs to millions, albeit on tiny salaries. Today, China holds key global economic and political influence. The Chinese have always taken a long-term view of events. They are proud of their ancient civilization and their modern achievements. Culture Smart! 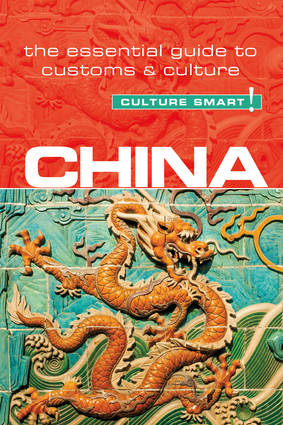 China aims to put all these changes into an historical context, explain deep-seated cultural attitudes, and guide the visitor through the maze of unfamiliar social situations. Chinese etiquette at home, at work and socially is helpfully put into. We hope it will enable you to discover for yourself the warmth, the intelligence, and the potential of the Chinese people. Do not give your Chinese friends a clock or a watch, as these words sound similar to ‘’take someone to their death’’. Other gifts to avoid are sharp objects; symbolizing the end of a friendship, handkerchiefs; usually reserved for the end of a funeral, pears; because the word for them, li, sounds like the word for parting; yellow chrysanthemums and any white flowers, as they too are seen at funerals; umbrellas; san in Chinese as the word sounds like another meaning to break up; and mirrors, which are believed to attract ghosts. If you wrap your present in red paper it will symbolize happiness and good luck.